Number exploration, so much fun in P1! After a really engaging CPD about conceptual number development, I challenged myself to do something a little bit different. I am very good at making maths matching games, but I wanted to give my children the opportunity to something different. At the counting table they can explore, play and figure things out for themselves. All they have to do is make the number and show it to me. The first week the children weren’t that interested at all, perhaps because they weren’t sure what to do. But with some stickers to motivate them, they were encouraged. 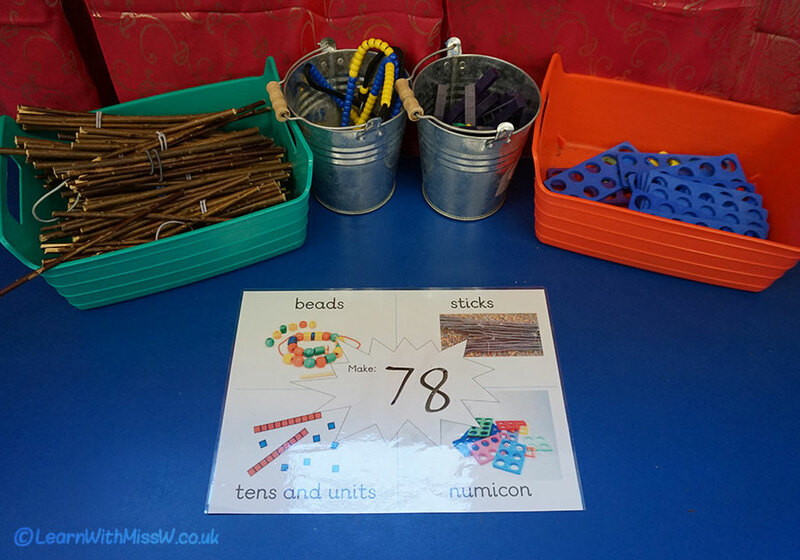 They are most familiar with numicon and I think that’s the resource they started using first. I haven’t actually taught them how to bundle the sticks into tens, so that took a little while to take off. We change the number every day or so, with the children often picking the number. So far we’ve had lots of 2 digit numbers and some 3 digit numbers, including 100 of course. It’s been really great seeing my kids talking about number and trying things out. I’ve also had a great insight into where the misconceptions lie and their understanding drops off.